“I always have my lights,” says UB student Scott Thomsen. A senior at UB, Thomsen has been bicycle riding for transportation since he was 8 years old. Thomsen started out by biking to swim lessons with his twin brother. The next summer, the twins biked to the pool again, this time for the swim team. Now, an experienced year-round cyclist, Thomsen has several suggestions for biking in snow and rain. “Not much weather stops me,” Thomsen says. He makes an excep- tion for lightning. Usually extremely punctual, he will be late to wait out a thunderstorm. No matter what the season, Thomsen always has his lights. “You never know when you’re going to get stuck somewhere after dark,” he says. Thomsen will even use his lights during the day, if it’s raining. Setting them to flash in order to be more visible. “Layering is important in winter, Thomsen says. He wears a baklava, long underwear and thick gloves. “I will always wear layers that have zippers on them,” he adds. When he gets to the top of a hill, he usually takes one layer off. Wilderness experts advise staying away from cotton when you’re looking for a winter base layer. Cotton retains moisture and even a small amount of sweating will make you colder. Polyester makes a better base layer, because of its moisture wicking technology. Any polyester shirt, leggings or long underwear will preform better than cotton. Read labels in your closet or peruse a local thrift store. DIY layering is low cost and can be effective with the right materials, especially for trips around the city. For recommendations on base layers designed specifically for bicycling, visit your local bike shop or REI. “Another way you can take control of your body temperature is by controlling the speed of your ride,’” Thomsen says. If he’s hot, he’ll go slower. Thomsen also rides more slowly if it’s snowing. He proceeds with caution during freezing rain, as well. He always tries to be especially careful when it’s raining and the temperature is 32 degrees Fahrenheit–or below. “Sometimes the salt is worse than the ice,” he adds. 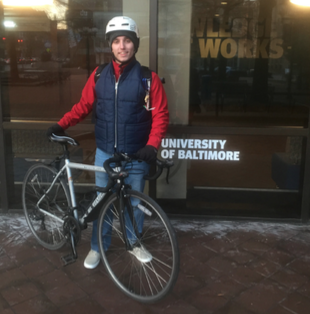 Although studded tires are available for winter riding, Thomsen doesn’t use them in Baltimore. “In New York I’d buy studded tires,” he says, but there’s not enough snow in Charm City to make it worthwhile. “The main enemy is salt,” says Thomsen. “I always wipe down my bike in winter. Every single time I bring it home.” He wipes down all the parts he can see. He also lightly wipes down his chain and puts a little bit of oil on it. “I’m free of car payments,” says Thomsen, who also likes being independent of his parents with regard to transportation. Thomsen also rides his bike to work, to run errands and get groceries. Visit Baltimore Bicycle Works for bikes, advice and gear. The shop is located two blocks from the UB campus at 1813 Falls Road. Want to bike with friends? Join the UB Bicycling Club! Have a safe and happy winter!